it's this two-syllable, challenging choke-hold-of-a-word that found me wandering aimlessly in the wood. 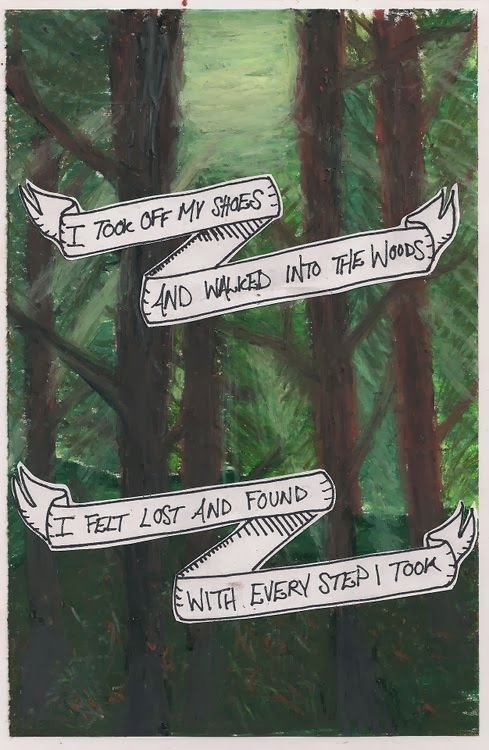 it was then that i knew that it was safe, and so "i took off my shoes and walked into the woods. i felt lost and found with every step i took." isn't it exciting to just let go and walk onward? there are untold open-ended possibilities with this one word, despite the obvious fear-struck part that accompanies such a bold declaration. it's the kind of word which causes you to pause and question all of your motives in doing so mid-roar; mid-step; mid-path; mid-breath. you see, this one word is so unbelievably scary to me. like, i cannot breathe right now scary. and there are no takesie-backsies. this word is my own. i declared it out loud, and now i have to own it. it is, after all, my own heart's roar that has found me; my Lion of Judah which has bewitched me. my wanting path: i want to live life with a brave-heart intact. to echo the hearts of my ink-heart-sisters. to find and use my own unique voice, because i owe it to myself. i don't want to just embrace and accept what comes towards me throughout the years anymore, i want to have the chutzpah to face the fear, wildly roar in it's face, declare my ground holy and run free in the other direction like mad. i want to see me be brave. to be unafraid to speak about the restlessness and jesus and freedom and feminist and dust and identity and truth and love and grace and questioning and real marriage and moving and wanderlust. i want to write and live them all . . . for these are the words that have me held as their captive. they've sent me on a soul-stirring adventure, tossing my dry weary bones out into the wild wood. a wild wood named self-discovery. and this place of self-discovery, question asking, and risk-taking . . . it frightens me, yet excites me all the same. maybe i am crazy - asking for it even? - what with this big-little-two-part word that is defiant; rebellious; counter-cultural. brave. i guess all i really needed was to give myself the permission to enter into the darker places, the hidden places of myself, the ones that need to come to the light, the 'Questions Asked and Dreams Pursued and Freedom Sought' places. the ones that are not so popular for women to choose and chase after. i'm off to do some walking in the wood; off to do some thirst-quenching and question asking. and surely i will see you here again soon. Written like a poem. And I love the title you chose!